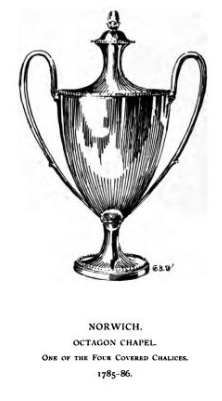 What shape the communion cup? Talk of the Annual Meeting of the (British) Unitarian and Free Christian Churches, and noticing the communion service there this morning, put me in mind of an quaint old book. The 1897 Vestiges of Protestant Dissent is something of register of British and Irish Unitarian, Free Christian, Non-Subscribing and kindred churches, with — and this is the part that amazes me — a listing of their communion plate. Much was then-new electroplate, but other pieces were quite old and noteworthy, so much so that several engravings were executed. What fascinates me is the use of porringers, posset-cups, “loving cups”, mugs and tumblers (beakers), and not just the accustomed chalice: that inverted bell on a stem, sometimes a knop, and foot we all know and associate with the Eucharist. Many long-time readers know I have an interest in found communion ware, and lament the division of the communion ware market into the unaffordable and the tawdry. Which will bring me to what I think is an ideal communion cup for our days, and particularly for Unitarian and Universalist ministers — and indeed at least one in Vestiges — who have to bring their own. For next time. The annual meeting of the General Assembly of Unitarian and Free Christian churches isn’t over yet, but they did pass (or seem to pass, if I read tweets correctly) two measures I think are noteworthy. The first gives the vote to the class of small congregations, (see measure 4) of which there are exactly two. Until now, a church with at least 8 but fewer than 12 members could could be recognized, with voice but no vote. What might have been called a mission church in another setting. Because there are full members of the denomination that have fallen below 12 members, members of the Bangor church — one of the two “small congregations” — sensed unfairness and petitioned the executive committee for a bylaws change. Eight and twelve members may not seem so different, but in a denomination with so many very small churches, it may mean the difference of encouraging more groups to organize, or not. The other measure shortens the annual meeting from 72 hours over four days to 48 hours over three days. Cost is the main stated reason, but I imagine time away from home or work is also a practical concern. The sample schedule is tightly packed, but seems feasible when it’s hosted at an all-inclusive conference center, as it is this year. It also means tightening up the legislative process, which we’ve also seen (to the good) on this side of the Atlantic. If I read correctly, the plan will be reviewed in three years. The Non-Subscribing Presbyterian Church of Ireland is an interesting church of 4,000 or more souls in Ireland (the island), mostly in Northern Ireland (that part of the United Kingdom) but one that’s hard to get a lot of current information about. I’m sure its status contributes to this: “kindred” to Unitarians (as the formula went a century ago) but distinct from the Unitarians found across the Irish Sea. But some good news today. Davis Steers, a NSPCI minister and writer, has put together a site about the church’s history and I look forward to reading it. I imagine that many readers were horrified to see the news of Burundian Unitarian minister Fulgence Ndagijimana being arrested and held by police. (UUA International blog) The #ReleaseRevFulgence hashtag is laudable, but I have a bit more faith in interceding with God and the Burundian ambassador. Here’s the letter I’m sending; you’re welcome to crib from it. And quickly. I learned today that a brother minister, the Rev. Fulgence Ndagijimana, of the Unitarian Church of Burundi (Eglise unitarienne du Burundi) in Bujumbura was taken into police custody around November 17, and also that members of his church are being harassed by police. I was horrified to hear this news, and generally about the unrest in your country. Ours is a peace-loving religion, resting on a deep foundation of mutual respect. So, I respectfully ask that you do whatever you can to have the Rev. Fulgence Ndagijimana released from prison, and to have the police stop intimidating or harassing the Unitarians of Burundi. I join hundreds of thousands of fellow believers around the word in petitioning you to help.